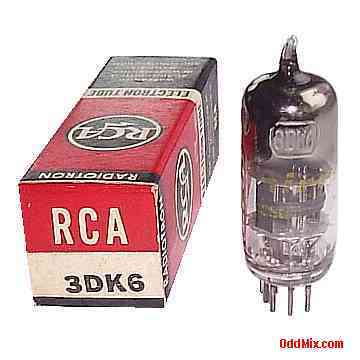 This is a genuine vintage 3DK6 RCA Radiotron Sharp-Cutoff Tetrode electron tube in it's original box. This is a vintage, collector's special vacuum tube. This high transconductance vacuum tube was developed for IF, RF Class A amplifier use in television and AM, FM receivers. Useful for antique radio restoration projects, replacement part, cirsuit design, experimentation or to set up a private vacuum tube museum. It is NOS tube - New Old Stock, unused, boxed, excellent condition.